Firstly there was the Eden Valley Epic. A sportive run on the quiet and scenic road between Penrith and Appleby. Roads I’m more used to thundering over on the way out/home from the Daft Ride in the Lake District/Pennines. I’d wanted to explore the roads round there a bit more for a while and, combined with Angela wanting to get her 2013 kicked off with a decent challenge, the sportive seemed like a good way to do it. It also signaled the start of “uncomfortably early alarm calls season”, which was less welcome. We arrived at the start of the ride in plenty of time for Angela to go and queue up to register us while I set about putting the bikes back together and, once timing chips had been ziptied to forks, we joined the massive line of riders waiting to set off. Angela and I didn’t hang around the mid way food stop for too long, taking just enough time to shovel lots of jam sandwiches and cake down our throats before heading back out onto roads we’d ridden in a recce a few months back. With the sun out, the roads dry and seemingly everyone else taking their time at the rest stop the route became much quieter and we began to tick off the miles seeing fewer and fewer riders. It was turning into a lovely morning out, though the brief pit stop and quickly drunk cup of tea had left me needing a, shall we say ‘private pit stop’! No worries, I thought, I’ll suggest to Angela that she has a final energy gel before the last climb of the day and while we stop for that, I’ll nip over a wall or something. Sadly, Angela had the bit well and truly between her teeth and, upon me mentioning having the gel, she made it quite clear that we wouldn’t be stopping. She’d have it ‘on the fly’ and we’d keep the pace up. Bugger. We hit the last climb full tilt, passing rider after rider, up out of the saddle having difficulty just getting up the slope and cruised out over the top in what I later worked out to be the fastest time of the day for the women. A good effort, rewarded with a nice long, mostly downhill cruise back to the leisure centre that was hosting the event. 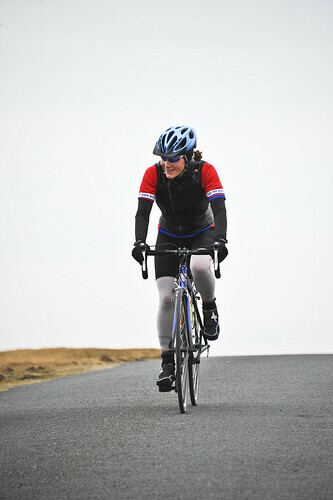 (Hello also to whoever it was who recognised me while we were stomping up the climb, as well!). Jase came down with a heavy cold in the week running up to the event, so had to bow out, but Phil had the Friday off work and had decided to ride to the start the day before and I’d booked the Travelodge for the night before and was far too tight to not make use of it (oh and I guess the idea of a big day out in the Welsh hills wasn’t too bad either 😉 ), so on the Friday night we found ourselves sat in a bizarrely crowded Welsh pub waiting for what turned out to be pretty rank food while chatting to the other riders who’d signed up for the challenge. After the worst night’s sleep in ages, and the earliest alarm call so far this year, we met up with Mike and Richard outside the castle walls and set of in pursuit of the groups who’d left earlier (the idea being that we were the ‘fast’ group and would catch the slower groups out on the road). Big Day Out chatter flowed nicely in between the climbs as we ticked the miles off, we passed a couple of riders who’d set off earlier after about 30 or so miles and, after spending most of the ride so far having no real idea where I was, I recognised a bit of road from another Daft Ride Jase and I had done a couple of years ago. 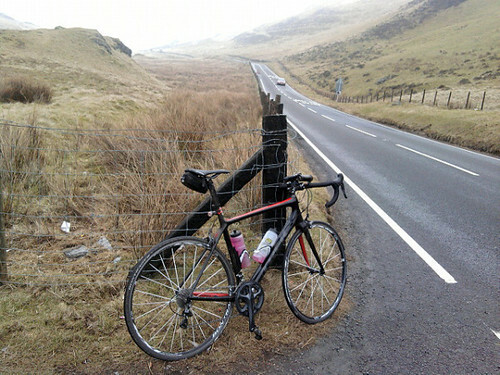 The road in question had stuck in my mind since first seeing it, even though I’d never ridden on it, having only driven over it on the way to Machynlleth to ride the Trans Cambrian Way. Shielded on either side by hills, the road dropped in a straight line with great views of the estuary below the town. It looked perfect for ‘tucking in and flying’. Speeds well in excess of 50mph were achieved with ease, though Phil did take a very ‘close to the drainage ditch’ line at one point, which was a bit exciting! the joy of the descent was short lived, however as , on the climb that followed, Phil discovered that one of his cleats had snapped, leading to a day of not being able to clip his right foot into the pedal. Normally this would just be ‘a bit of an issue’ but with 140 miles left to ride to me it seemed like a big problem. Phil didn’t seem unduly bothered though, even when we found that the one bike shop in the vicinity was shut, so he’d have to put up with it all day. Once out of Machynlleth we hit the biggest climb of the day, over what was ominously referred to as “the mountain road” – a diversion from the main route we took to add some extra thrills, scenery and effort into the day. This didn’t disappoint either! A strip of singletrack tarmac draped, ribboning over a mountain shrouded in mist that seemed to keep going up for an unfeasibly long time. It’s gradient would change as corner after corner revealed more climbing, steep, then shallow, then steep again, even with our pace muted by the length of the ride we still had to do, it required full on effort in parts and had easily earned it’s place as a classic in my mind by the time we crested the summit and began to drop back down. We rejoined the main road through Llanidloes as I once again recognised where we were thanks to previous drives down to the Real Ale Wobble. The flatter sections resulted in our pace rising once again as we took it in turns to sit on the front, pulling everyone else along as quickly as we could until we hit the midway point at Rhayader with less than 6hrs on the clock. 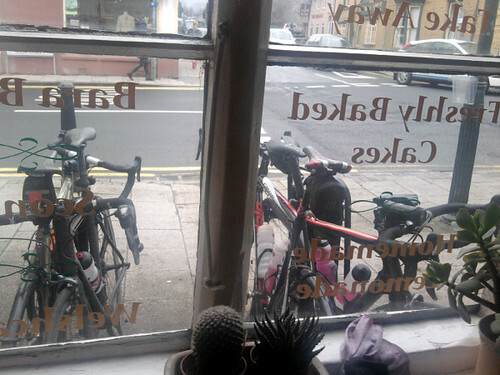 The lure of the cafe was too strong to resist, not that we would have tried so we piled in, shocked some grannies with the distance we were planning for the day and pretty much committed a smash-and-grab on the cakes, toasted sandwiches and coffee supplies. As various confectionery products were shoveled down throats, Huw Thomas arrived having ridden up from Cardiff to meet the group and ride back with them. It was all very sociable, but we knew that too much time spent sitting round would come back to haunt us later, so after wishing each other good luck, Phil and I set off on our return journey while Mike et al continued south. Our route back was designed to take in more of the back roads over the hills to make it a bit more interesting than just heading back the way we’d come and I have to say it was fantastic. The weather had improved from a slightly grimey drizzle during the morning, with views opening up around us as we rode deeper into the hills and the constantly undulating, flowing road kept us entertained for a good couple of hours. We’d planned a long flat section towards the end of the ride, working on the assumption that we’d be tired and sick of hills by the time we got to it. It turned out that we still felt fresh as we headed towards Barmouth, pausing for a few minutes to rescue a stranded cyclist with a puncture and no more spare tubes. A ride along the coast changed the atmosphere of the ride as rolling hills and craggy mountains gave way to long stretches of sandy beach and seaside towns. 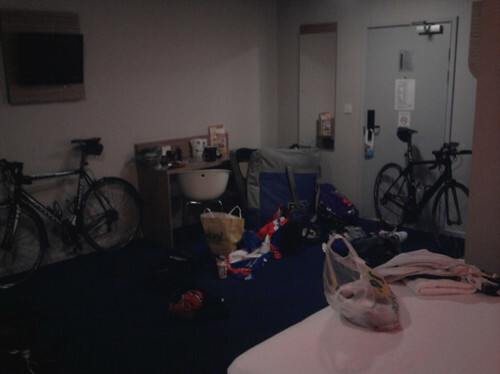 We rode past rows of summer-holiday-themed shops, all shut, with Phil’s rear hub – which had started making some unhealthy noises before we’d even got halfway and was now protesting loudly – echoing off the darkened windows. A plan to stop for an ice cream and brew fell by the wayside as we traveled through deserted town after deserted town. Clouds began to darken again as we made our way towards Porthmadog and the rain we hadn’t missed reappeared just as the sun set. Back on main roads again the final 20 or so miles felt like they were dragging, even as we got our heads down and forced the pace back up over 20mph over the final few rises and round roundabout after roundabout. We didn’t feel tired or overly worn out, but Caernarfon couldn’t come quick enough by the end, partly due to wanting to get out of the rain and partly because we’d promised ourselves a curry after the ride. On arrival back at the car we did the ‘car park shuffle’, getting changed in public, as many a great ride has ended, before heading over to a curry house and decimating their food stock while planning future trips, alterations to the route we’d just done and generally feeling pretty chuffed with both ourselves and everyone in Mike’s group who’d made it to Cardiff in about the same amount of time. And now, just like the ‘real’ classics season, there’s no let up in the number of up coming rides and events. In the next few weeks cobbles will be thrashed, steep hills attacked, long routes navigated and a summer of racing prepared for in the best way possible. Bring it on!